In their first work project together, Ivan and Jason Reitman are winning over critics with "Up in the Air." 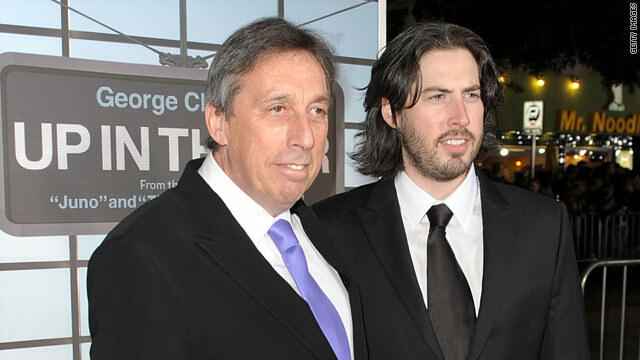 Ivan and Jason Reitman are the father/son tandem behind award darling "Up in the Air"
The father, Ivan was the producer behind "Ghostbusters" and "Animal House"
The son, Jason grew up on sets and directed "Thank You for Smoking" and "Juno"
(The Frisky) -- There are certain families -- like, say, the Coppolas and the Gyllenhaals -- where coolness seems to be infused in the DNA. I'd like to add another to the list: the Reitmans. Papa Ivan is the producer behind flicks like "Ghostbusters" and "Animal House," and son Jason grew up on his sets. "I was on the set of 'Animal House' when I was 11 days old. It had a profound effect on me," Jason joked this week on "Late Night With Jimmy Fallon." When he was in his early teens, Jason started working as a production assistant and his dad even cast him in a few small roles. "I was 13 and my dad gave me a scene in 'Kindergarten Cop' kissing a girl -- and that was in fact my first kiss," said Jason. "My first kiss was directed by my father. You don't know what it's like to have to do eight takes of your first kiss while Arnold Schwarzenegger's pointing a gun at you and your dad's like, 'Grab her a little more.'" While Jason probably could have busted into filmmaking by birthright, he decided against directing "Dude, Where's My Car?" which he was offered, and instead worked on short films to gain clout. "It's interesting because I avoided working with my dad for a while because I was so sensitive of being accused of the idea of nepotism," he said. "I remember when I was 19 years old I started a desk calendar company to pay for my first short film just so I could say one day my daddy didn't pay for my first short film. And I really established myself through the film festival world, starting at Sundance and lots of film festivals and really took on a different style of film from my father." Soon, Jason directed "Thank You For Smoking." Then the amazingness that was "Juno." And now, of course, he is the Best Director/Best Picture forerunner with his movie "Up In The Air," which is getting all sorts of critical acclaim. "Up in the Air" is the first project the two worked on together. "I love my father and we have such a strong bond and I look up to him as a filmmaker and a storyteller," said Jason. "So it was great and when I see the credits and it says produced by Ivan Reitman and Jason Reitman, my heart swells. It's really, really cool." Ivan echoes that sentiment. "It's great to be the producer of this kind of movie and sort of share in its success and the goodwill that comes with it," he said. "But as a parent it's kind of this remarkable emotional moment that's kind of hard to describe." And it's not like Ivan's career is over -- he has a script in the works for "Ghostbusters 3" and the word on the street is that Bill Murray will be making a cameo in it as a ghost himself. Could this family be any cooler?